Nearly 30,000 runners come out to run the streets of Virginia Beach every year around St. Patrick’s Day at the annual Yuengling Shamrock Marathon, Anthem Half Marathon and TowneBank 8K race, which follows a point-to-point route that starts on Pacific Avenue and finishes on the oceanfront, in front of Neptune’s Park along the beach. The course for the half marathon features an elevation that changes by only about 20 feet over the course of the race. Though there are some rolling hills here and there, overall the course is fast and flat thanks largely to its location near the oceanfront here at Virginia Beach. From the starting line at Pacific Avenue and 42nd Street near Cavalier Park, runners head north along Atlantic Avenue for the first few miles, until they make their way into Fort Story, now known as the Navy’s the Joint Expeditionary Base East. They’ll make their way for a pair of loops along Atlantic Avenue and Shore Drive through Fort Story, located on Cape Henry near the entrance to Chesapeake Bay. After that, the course brings runners back onto Atlantic Avenue, where they head south in the opposite direction from earlier. 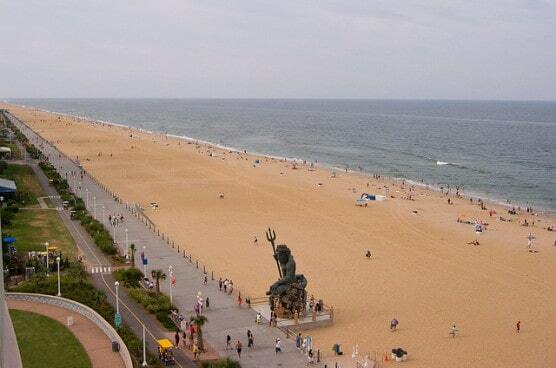 The final couple of miles bring them past the starting line area and onto Atlantic to 37th Street, where they turn left and head toward the beach, turning onto the Virginia Beach Boardwalk for the home stretch in to the race finish line at Neptune’s Park. The Shamrock Half Marathon is limited to the first 10,000 entrants — 6,800 runners crossed the finish line in the 2016 half — and the course time limit is 4 hours, which means you’ll need to keep a pace of 18 minutes, 19 seconds per mile or faster. The early weeks of spring can still be quite cool in the Virginia Beach area, especially in March, when temperatures average between 40°F and 59°F. Come prepared for rain, as the month sees an average of nearly 4 inches of precipitation. On the day of the race (March 17), the average low is 42°F and the average high is 60°F. See the race route map for the Shamrock Half Marathon here. To reserve your spot in the late winter/early spring running 2019 of Virginia’s Yuengling Shamrock Marathon, Half Marathon or 8K race, register online at HakuApp.com here. Ever run in the Shamrock Half Marathon? Share your impressions here, or post your review in the Comments box below. I was disgusted we had no enclosed area to change. A half enclosed coed tent for the world to watch. There were many young ladies ( 10 to 16 years old ) exposed to whomever walked by as they struggled in the wind and rain to change. Each year the runners recieve less while the profits for the city and J & A Racing increase.